According to a Small Business Association study, the average small business owner spends 25%+ of the time handling employee-related paperwork. This average increases to a staggering 35-45% if the tasks include recruitment, hiring, and training of new employees. After all, you have no interest in processing payroll twice a month, negotiating benefits with insurance carriers, or worrying about how to comply with a litany of government regulations. You entered into business to build a lasting legacy, deliver great products or services, and generate revenue doing what you do best. 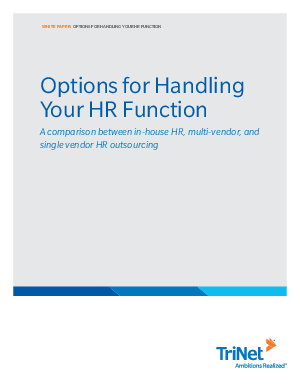 So why NOT outsource HR?